The magnitude and frequency of floods at 20 streamflowgaging stations on small, unregulated urban streams in or near South Carolina were estimated by fitting the measured wateryear peak flows to a log-Pearson Type-III distribution. The period of record (through September 30, 2001) for the measured water-year peak flows ranged from 11 to 25 years with a mean and median length of 16 years. The drainage areas of the streamflow-gaging stations ranged from 0.18 to 41 square miles. Based on the flood-frequency estimates from the 20 streamflow-gaging stations (13 in South Carolina; 4 in North Carolina; and 3 in Georgia), generalized least-squares regression was used to develop regional regression equations. These equations can be used to estimate the 2-, 5-, 10-, 25-, 50-, 100-, 200-, and 500-year recurrence-interval flows for small urban streams in the Piedmont, upper Coastal Plain, and lower Coastal Plain physiographic provinces of South Carolina. The most significant explanatory variables from this analysis were mainchannel length, percent impervious area, and basin development factor. Mean standard errors of prediction for the regression equations ranged from -25 to 33 percent for the 10-year recurrence-interval flows and from -35 to 54 percent for the 100-year recurrence-interval flows. The U.S. Geological Survey has developed a Geographic Information System application called StreamStats that makes the process of computing streamflow statistics at ungaged sites faster and more consistent than manual methods. This application was developed in the Massachusetts District and ongoing work is being done in other districts to develop a similar application using streamflow statistics relative to those respective States. Considering the future possibility of implementing StreamStats in South Carolina, an alternative set of regional regression equations was developed using only main channel length and impervious area. This was done because no digital coverages are currently available for basin development factor and, therefore, it could not be included in the StreamStats application. The average mean standard error of prediction for the alternative equations was 2 to 5 percent larger than the standard errors for the equations that contained basin development factor. For the urban streamflow-gaging stations in South Carolina, measured water-year peak flows were compared with those from an earlier urban flood-frequency investigation. The peak flows from the earlier investigation were computed using a rainfall-runoff model. At many of the sites, graphical comparisons indicated that the variance of the measured data was much less than the variance of the simulated data. Several statistical tests were applied to compare the variances and the means of the measured and simulated data for each site. The results indicated that the variances were significantly different for 11 of the 13 South Carolina streamflow-gaging stations. For one streamflow-gaging station, the test for normality, which is one of the assumptions of the data when comparing variances, indicated that neither the measured data nor the simulated data were distributed normally; therefore, the test for differences in the variances was not used for that streamflow-gaging station. Another statistical test was used to test for statistically significant differences in the means of the measured and simulated data. The results indicated that for 5 of the 13 urban streamflowgaging stations in South Carolina there was a statistically significant difference in the means of the two data sets. For comparison purposes and to test the hypothesis that there may have been climatic differences between the period in which the measured peak-flow data were measured and the period for which historic rainfall data were used to compute the simulated peak flows, 16 rural streamflow-gaging stations with long-term records were reviewed using similar techniques as those used for the measured and simulated data at the urban streamflow-gaging stations. For the rural sites, the period from 1985 to 2001 was compared with the data measured from the beginning of record to 1984. Plots of the two periods at each rural site indicated no significant difference in the data. The statistical test for comparison of variances was applied to the 16 rural streamflow-gaging stations, and the results showed that there was no statistically significant difference in the variances at 14 of the 16 streamflow-gaging stations. The statistical comparisons of the means for the two periods at the rural streamflow-gaging stations showed that there was no statistically significant difference at 12 of the 16 streamflow-gaging stations. Based on these comparisons, the differences between the measured and simulated urban water-year peak flows cannot be completely explained by climatic differences between the periods of record. 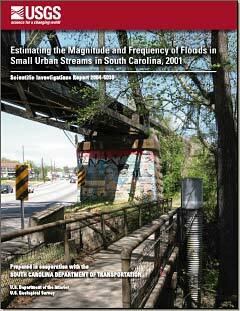 Feaster, T.D., and Guimaraes, W.B., 2004, Estimating the magnitude and frequency of floods in small urban streams in South Carolina, 2001: U.S. Geological Survey Scientific Investigations Report 2004-5030, accessed May 18, 2004, at https://pubs.water.usgs.gov/sir2004-5030 [available online at https://pubs.usgs.gov/sir/2004/5030/]. For more information, contact the South Carolina Publications Unit.